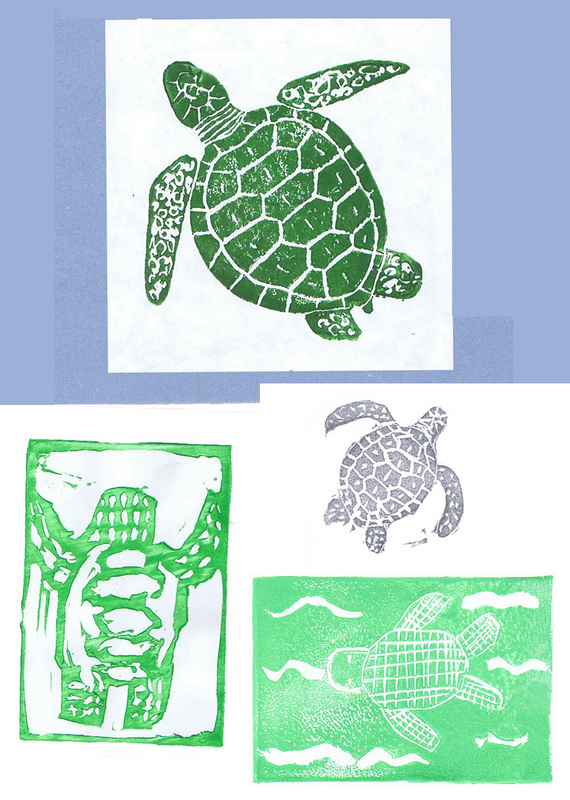 For some reason there was quite a run on sea turtles in my printmaking classes, and five students made seven rubber block prints of these most excellent creatures. I can’t resist sharing them with you today. It isn’t really remarkable that when groups of kids work together, common themes emerge. One person comes up with a good idea, and others are inspired by it. It’s perhaps a little more surprising that sea turtles were so popular with both my morning and afternoon groups, but still perfectly understandable that they should have seen each other’s work. What really tickles me about this, though, is that, as usual, the young artists who made these block prints (ranging in age from fourth grade to eighth grade) each made something unique and distinctive. patterns of the shells, and at least three unique interpretations of the texture of the flippers. We have different color choices, as well, and even variations among the greens. Some of these designs were pretty ambitious, others were quick and easy. 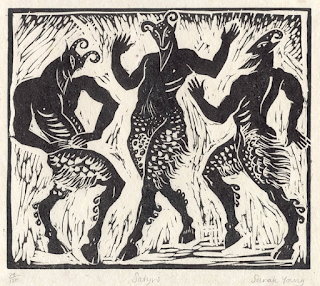 Seeing these six rubber block prints should be enough to impress you with the high quality of artistic work the next generation of printmakers can achieve! The shortest distance between a human being and truth is a story. 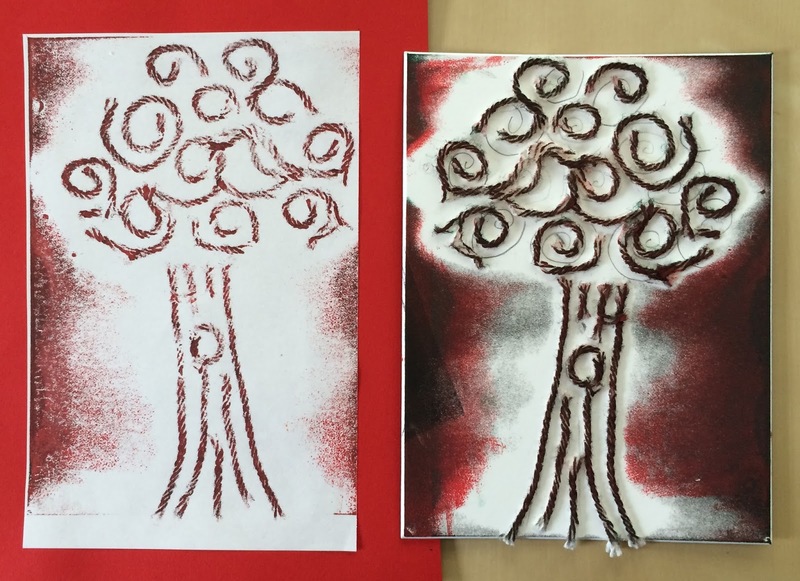 This is the third summer I’m teaching printmaking, and I’m once again pleased with the kids’ work so far. So I thought I’d use their work to illustrate one of the projects we did. 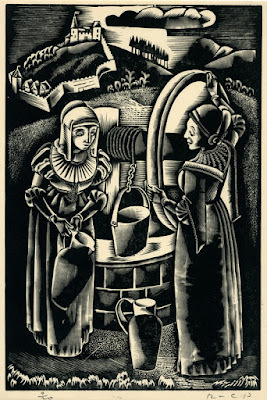 This is a simple way to make a relief block print not by carving down low areas but by adding raised lines to a base. For the bases my students use mat board - all the squares and rectangles of mat board that are just too small to be used to mat anything else: pieces in the 4x6 inch range. Of course any sort of stiff cardboard would do. The students could draw a design on their base with pencil and then carefully add the raised lines following their guide, or they could just start in doodling any which way. Last year the raised lines were made by gluing cotton yarn to the base. This was a little messy, and limited the sorts of lines or dots kids could make. On the other hand, it ensured that the lines were a consistent height, and the texture of the yarn’s twist made a nice pattern in its own right. The tree below was done with yarn. This year I had the kids try something new: puff paint. The puff paint came in little bottles with a beautiful fine tip to squeeze out a line of paint. It allowed quite a bit of control, and allowed little dots and sharp zigzags in a way that yarn did not. The advantage of the puff paint over straight-up white glue (which I had the kids try two years ago) is that it’s more dimensional and stays where it’s put better. Also, theoretically it’s a little softer (as in puffier) when dry, thus making inking and printing come out better. I admit to being disappointed by the puffiness of the particular brand we used (Tulip "Puffy"). The instructions said you had to activate the puff by steaming it, but even when I tried I never noticed much difference. So the kids printed with their “unpuffed” paint and I think it still worked pretty well. - The paint (or glue) must dry thoroughly, so don’t even try to do this project in one day. I had kids make their blocks yesterday and not print until today. - Any large flat areas with no paint will inevitably get ink. So go with it. Use a base with texture and deliberately get extra ink on the base. Or use monoprinting techniques to press in some areas more than others and get different effects. Or allow the interest to come from the white areas immediately around the raised lines. 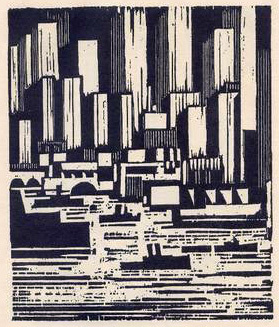 - I’m a big fan of back-of-the-wooden-spoon printing, but for these blocks a press of some sort works wonders. It helps get all the lines to show up clearly, rather than just the very highest. - Let’s be honest: this will never be as cool as carving blocks. But it can be done with younger kids, and without so many tools, if those are important concerns. Plus it’s fun to have something a little different to get kids thinking about more relief print possibilities. It’s poetry time again, and this dark piece is by Robert Graves. Graves is primarily known as the author of I, Claudius and other historical novels. I’m not sure when he first wrote the poem, but he revised it heavily around 1938, and I believe this is the later version, which I think is indeed better. (You can find the other version on the web, too.) He had a special interest in Classical mythology, but I don’t know that this poem conjures up the gods of Olympus for me. The gods here in the wet woods are even older, although they could include Pan, Bacchus, Selene, Medusa, as well as any prehistoric gods of dark power. As a fantasy poem, I find its imagery very evocative. I’m pretty excited about the New Horizons space probe and its Pluto flyby, but given the history of astronomy and relief block printing, I don’t know of any appropriate art of Pluto to share with you in celebration. 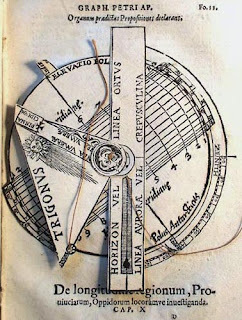 So instead I’m looking at things more generally astronomical, and I’ve found some really cool paper instruments. 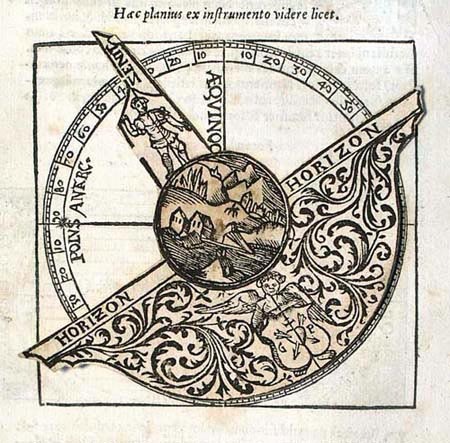 I certainly think of pop-up books and paper cut-out kits as a modern phenomenon, but I discovered that in fact shortly after the invention of printing, the new technology was already being applied to scientific instruments in the 1470s. It’s not my purpose to give a history of the different types of instruments or the different ways they were to be used in situ, or cut out and glued to card or wood, or folded here with the tab inserted there… I’ve simply got some photos of particularly cool examples with plenty of moving parts. I begin with one of the simpler instruments, a volvelle marking the horizon. 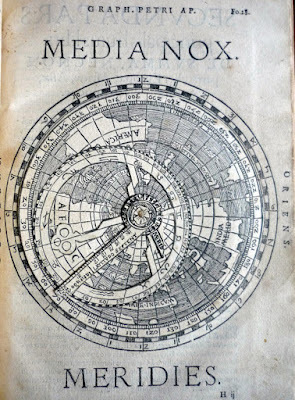 Volvelles are spinning wheels and one of the most popular moving features in books, then and now. Because it doesn’t require a lot of technical stuff, the designer has filled up all the space with art: a man standing upright pointing to the zenith; mountains, waters, and houses on the little Earth; and lovely swirls and an angel below the horizon. 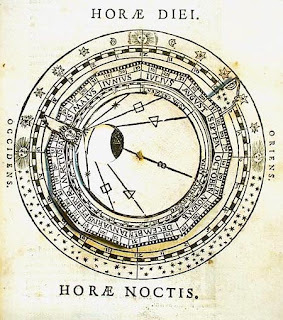 The next volvelle is a lunar clock. 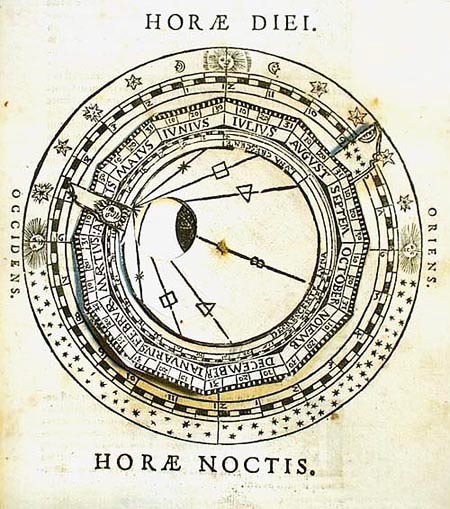 You set the phase of the moon in the little window, then use the angle of the moon to determine the location of the sun at night, and thus the time. The little pointers for sun and moon are decorated with their little smiling icons, while a spangling of stars and suns enhance the border. These first three examples all come from 1533, from a very popular book made by the mathematical instrument-maker Gemma Frisius, which was an enlarged edition of Petrus Apianus’s Cosmographia. 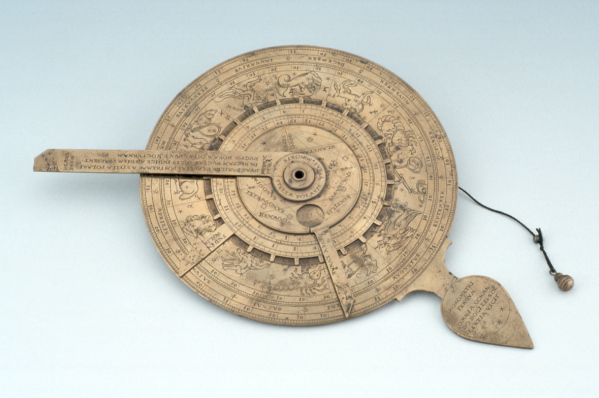 Apianus called this instrument “Ptolemy’s Instrument,” and it is used to tell the time, plus the times of sunrise and sunset in any latitude. Note the grinning face decorating the center. I don’t know for sure about the strings, but I’m guessing one was to have a weight attached for use as a plumb. Some sundials also used a string as a gnomen. One advantage of instruments printed in books was that their instructions for use were always right there with them, as long as you read Latin. respectable-looking instrument. This one does have a small weight attached. 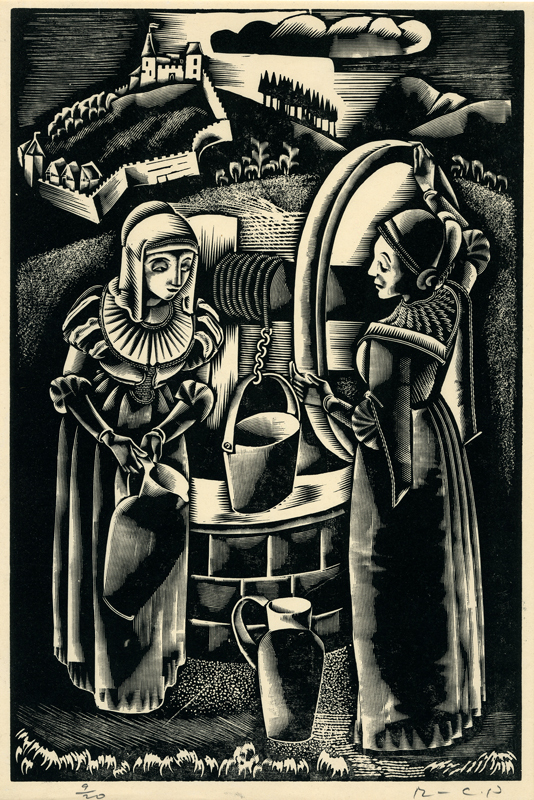 It also looks like it’s engraved, rather than wood block printed. It, too, was for telling the time based on astronomical observations. It’s by Caspar Vopel in 1552. And finally, another instrument from Frisius, this one from a 1584 edition. It marks the path of the sun over a projection of the Earth. Note that its prime meridian is off the west coast of Africa, as established by Ptolemy, and it counts all the way around to 360° instead of plus and minus 180°. Note also the charming obligatory sailing ship in the Atlantic Ocean. The thing is, these paper instruments are simultaneously works of beauty and utility, mass-produced relatively cheaply and yet with sufficient precision to fuel the scientific advances of their time. They’re reminders of the importance of exploration, study, and discovery, and also of the importance of popularizing science and making it more accessible to more people - seeking new horizons, and bringing them back to familiar territory. As such, I think they fit in perfectly with this summer’s hoopla over New Horizons and our new discoveries about Pluto. It’s not uncommon for me to have a few different art projects floating around my head and studio in a few different stages, but right now I have no fewer than five, and an unusual number of them actually underway, rather than just ideas for what to do next. So I’ll share them, in order of how far along they are. 1. Unicorn. I just finished carving this today, and am ready to do a test inking and then presumably it’ll need a few tweaks and touch-ups before final printing. It’s actually a linoleum block, which I haven’t carved in a long time, and this block is dark lino with a white surface so that you can see where you’ve carved. Great idea, except that of course it’s the negative of what will be black and white when I print, so it may be rather misleading. We’ll have to see. 2. Butterflies. The first (on the right) is completely carved, tested, touched up, and ready to print. It’s only waiting for the second (on the left) which is about halfway done. I have various schemes in my head for printing using watercolor backgrounds and multiple impressions on each paper, and all sorts of interesting things. I’ll be sure to share more on these experiments… when I get around to them. 3. Grist mill. I started carving this block at my last show, but haven’t touched it since. I plan to work on it some more at the Needham Farmer’s Market, where I’ll be this Sunday. It’s got a lot of tiny details, so I’m not sure how far I’ll get, or whether it will once again languish unfinished until the next show after that, in August. 4. The piece of paper is the beginnings of my sketch for what will be, as you can see, one of my biggest blocks ever. I was quite fired up about this one early in the year, but since it’s too big to work on at shows, it kept getting set aside all spring in favor of other blocks, and I lost steam. I still hope to get back to it eventually as I think it’ll be a really cool one. 5. Industrial scene. I took this photo yesterday and am thinking of how to turn it into a block. 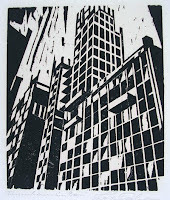 My industrial scenes have not been great sellers (They aren’t cats, after all!) but I really enjoy doing them, so I plan to follow my muse. The fun part is how to simplify the complex rigamarole of pipes and struts and Stuff, and how to make it all show up with nice clear contrast, black against white and white against black. As you can see, I’ve got plenty to work on, (and that’s not even counting the writing, which I’ve been working on intermittently, too). It’s a bit distracting to have so many projects, but certainly fun - much more fun than having no projects at all, for sure! 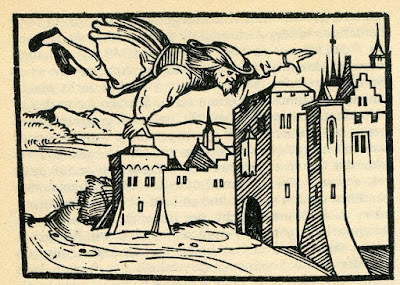 At all ages, if [fantasy and myth] is used well by the author and meets the right reader, it has the same power: to generalize while remaining concrete, to present in palpable form not concepts or even experiences but whole classes of experience, and to throw off irrelevancies. But at its best it can do more; it can give us experiences we have never had and thus, instead of ‘commenting on life,' can add to it. In a real sense, people who have read good literature have lived more than people who cannot or will not read… It is not true that we have only one life to live; if we can read, we can live as many more lives and as many kinds of lives as we wish. 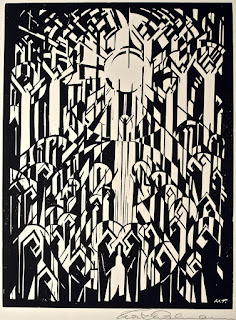 figures, build up all the pieces, with variations of black and white, arrangement and scale. They end up as explorations of light and shadow, evoking both the scintillating light of stained glass windows and the glowing halos of processions of saints. 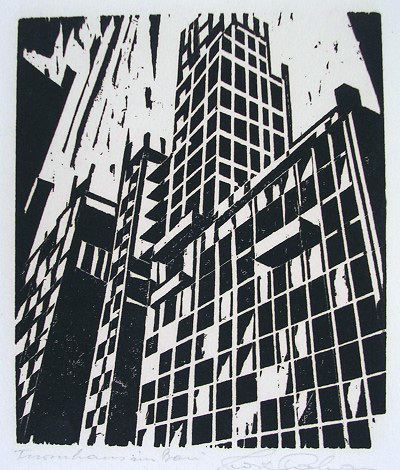 By contrast, the pieces in America in Woodcuts, inspired by a trip to the United States in 1923-4, are much more varied, and much more specifically representational. Although I can’t find that Thalmann labelled the scenes as representing actual locations, I can certainly believe that they do. 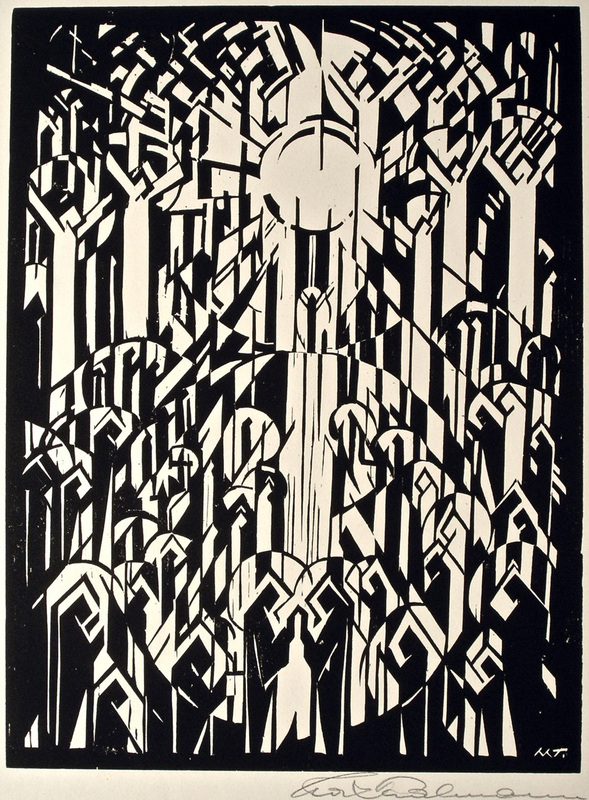 Despite seeming more realistic than the Cathedral series, you can still see that Thalmann stylized his views heavily, and reduced the scenes to their geometry. I have to agree with the blurbs I found on Thalmann, who all claim that he’s underrated and undeservedly unknown. I think his work is unique and interesting, and I like it.